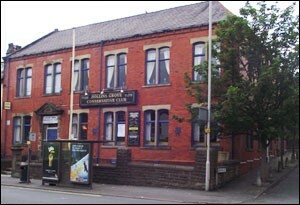 The club was founded in 1877. The club owes its origin to a number of working men who at that time were members of the Liberal Club at Lynwood. This was the only institution of its kind in this part of the town where men congregated for conversation. These men held political beliefs that were conservative and agreed to meet in the cellar of Mr Billy Holden, Clarence Street. The agreement was that they should start a conservative club where like minded people could meet and have a space of their own. In recent times the club has been run by its management committee donating their valuable time to benefit the members. People often ask who owns the club the answer is historic but quite simple: the members own a equal share of the club, and this is how it was started. The Club has benefited from numerous contributions along the way and original investments were made from generous sources. An honourable mention must go to Sir John Rutherford who invested heavily in the Club and even left a sum to the club in his final will.